In the café Brasileiro, you'll spike a steaming cup of coffee with cachaça. Brazil's answer to rum is a wonderful option but this hot cocktail recipe is a little more complex than simply pouring a single shot. This recipe was created by John Gakuru for Sagatiba Pura Cachaça. It pairs the cachaça with a dark chocolate liqueur and is best with the darkest, richest cup of coffee you have the capability to make. The fresh vanilla cream finishes it off in high style. There's no big secret to making it, either. All you need is a cocktail shaker, a vanilla bean, and some cream; it mixes up in less than a minute. Note: while there are multiple steps to this recipe, this cocktail is broken down into workable categories to help you better plan for preparation and assembly. Scrape the seeds from a vanilla pod into a cocktail shaker. Add heavy cream and shake vigorously for 20 seconds. Keep refrigerated if you're not using it immediately. 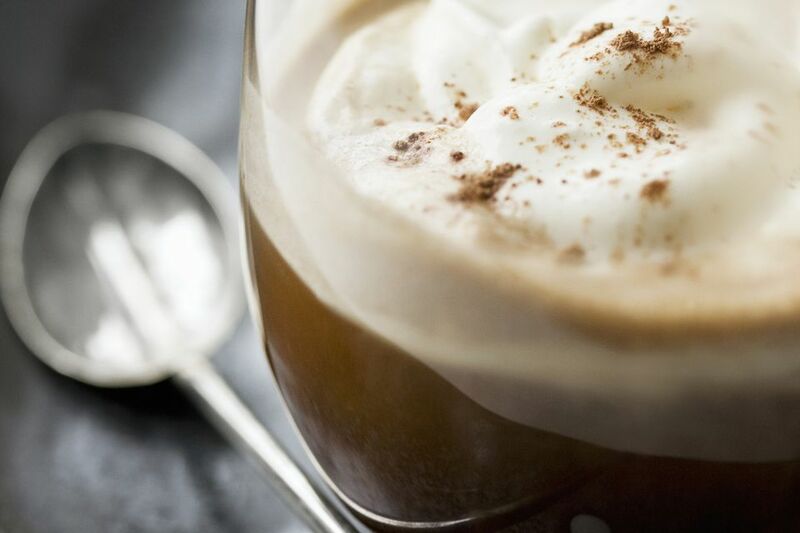 In an Irish coffee glass or mug, stir together the cachaça, chocolate liqueur, simple syrup, and coffee. Slowly and gently layer the vanilla cream onto the surface of the drink. There are numerous options for the dark chocolate liqueur. Dorda, Godiva, and Mozart are a few brands that are fantastically rich and delicious. You can also pour dark crème de cacao if you prefer. Vanilla beans can be expensive, but the fresh taste is worth it in the vanilla cream. For a single drink, use just half a bean if you prefer. You can also add as much as 6 ounces of cream for a whole bean and make a large batch at once. It should stay fresh in the refrigerator for a day or two, though you may want to shake it up just before using (a 30-second whip with a whisk works well too). Alternatively, simply shake 1 teaspoon of vanilla extract for every 6 ounces of cream. Taste it and add more if you prefer. The other option is to make fresh whipped cream. This recipe adds powdered sugar and vanilla extract and requires about 8 minutes of mixing to fully whip up. How Strong Is a Café Brasileiro? As with most coffee cocktails, the café Brasileiro is a very gentle drink. The alcohol content should fall somewhere around 10 percent ABV (20 proof). That's about the same as drinking a glass of wine, but far more soothing and flavorful. How Much Caffeine Is in Your Starbucks Drink? How Can You Enjoy Nutmeg Coffee, Tea, and Drinks?